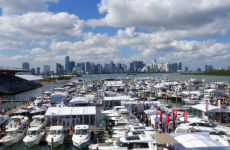 The big news about the big Miami boat shows next month is that the Miami Yacht Show, which had been up on Collins Avenue in Miami Beach for the past 30 years, is moving to downtown Miami. The traffic problems on Collins, and the show’s distance from the large Miami International Boat Show down on Virginia Key, were just too much. 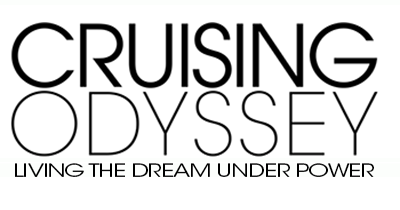 This year the yacht show will open at its new location on Biscayne Bay, at One Herald Plaza, between the MacArthur and Venetian Causeways, with a brand new look and layout; it also will be at Sea Isle Marina behind the Biscayne Bay Marriott. Both shows will run from Thursday, Feb. 14, through Monday, Feb. 18, over Presidents’ Day weekend. Parking and transportation to and from both shows promises to be better than before. 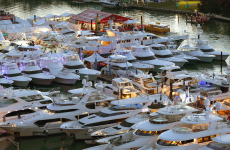 There’s a parking garage with 3,500 spaces next to the yacht show, while the National Marine Manufacturers Association, which runs the boat show on Virginia Key, has organized more shuttle buses and water taxis from downtown Miami. It also will have TV screens on site so you can track water taxi arrival and departure times. The yacht show will have the same number of boats as it did up on Collins, about 500 new and brokerage boats from 40 to 320 feet, but they’ll be in two side-by-side locations. (At the Collins Avenue location the show stretched out for more than a mile and a half.) It will have the usual array of new boating technology and accessories, plus displays of exotic cars and private aircraft. It also will have water taxi access to the Superyacht Miami display on Watkins Island nearby. If you want to avoid the crowds, the yacht show has a climate-controlled Windward VIP Club, with concierge services and an open bar and gourmet food service from morning through evening. It costs $200 per person, but that includes admission to the show. 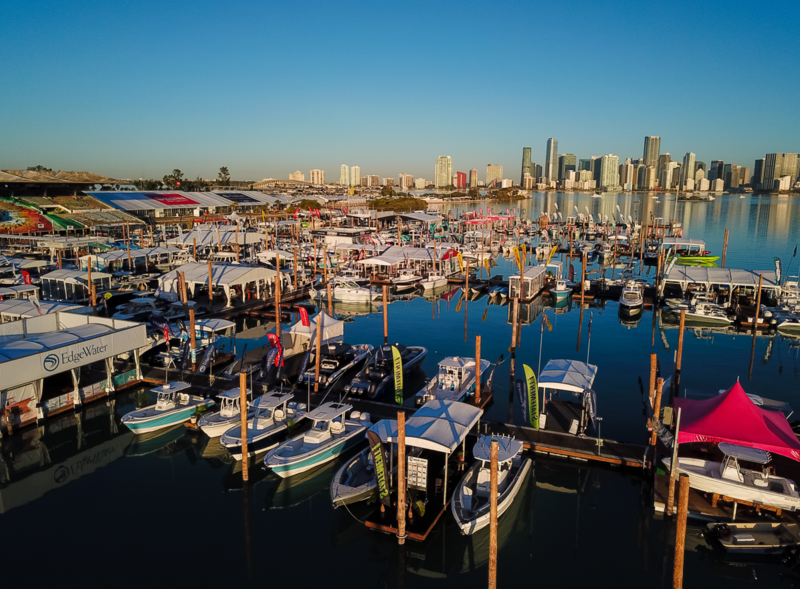 To get to the NMMA’s boat show on Virginia Key, water taxis will run from Bayfront Park and the American Airlines Arena to the show’s location at the Miami Marine Stadium, from 8 a.m. to 7 p.m. You need to show an admission ticket to get on board. A free shuttle bus runs from Bayfront Park, the American Airlines Arena, and the Brightline Hickman and West Garages to the stadium; you do not need an admission ticket to board the bus. The boat show, now in its 78th year, will have $3 billion worth of new boats and accessories on display from more than 1,100 exhibitors. It will feature 1,400 new boats from 10 to 100 feet, and offer in-water demo docks and boat-handling courses. An Intro to Boating course and a Women Making Waves course will be presented by Boat U.S., offering three hours of on-the-water experience. Each one costs $149, which includes admission to the show. The boat show will have a luxury VIP Lounge in an air-conditioned space; it also has an outdoor deck with views of downtown Miami. You’ll find complimentary food and drink and a place to relax; it costs $175 per person on Thursday and $150 per person for the other show days, which includes admission to the show. Beneteau has just launched a new line of outboard-powered pocket coastal cruisers. 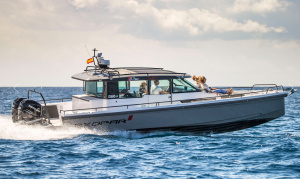 Called the Antares, the new line has a 27, 23 and 21, all products of the Beneteau design team and meant to be introductory boats for coastal or lake cruising. All powered by Mercury outboards, the 27 has twin 200-hp engines; the 23 a single 250-hp engine, and the 21 a single 175-hp engine. A bow thruster is optional to help with docking. The Antares 27 has a glass sliding door opening to the salon from the cockpit. With light coming in from a panoramic sunroof and large windows all around, the salon is bright and warm, with visibility all around from the helm. A U-shaped dinette settee is on the port side with a table, and galley is to starboard. The co-pilot’s seat on the port side swings around to either face forward or aft to join the group at the dinette. A sliding door next to the helm gives immediate access to the starboard side deck. The cockpit has a large bench seat aft that slides forward to raise the engines easily with a settee on the port side. The whole area can be covered to make a huge sunlounge. Another sunpad is on the foredeck. Below, the cabin is in the bow with a V-berth for overnights. A head and shower are to starboard. With its 21’6” draft carried all the way forward, the Aquila 44 catamaran has space – and more space – just about everywhere. The three-stateroom, three-head boat also has a lot of privacy. The master stateroom is forward with a king-sized bed, a small settee in a separate seating area and a large head and shower. The two separate hulls, meanwhile, mean the two more staterooms, one on the port side and one to starboard, are totally private, a major advantage during cruise with family or friends. In the salon, the galley is aft, with a dining/sitting area forward; it’s bright and light, with windows all around. Up top, the bridge deck can hold a crowd. The upper helm seat can hold four, there are settees on each side and a wet bar and grill, with more seating, is aft. If you need to reach the bow for, say, anchoring or line handling, built-in stairs lead from the bridge down to the foredeck. For power, the Aquila 44 has two 225-hp Volvo diesels, which produce a cruising speed of 14 knots and a top speed of 19 knots. 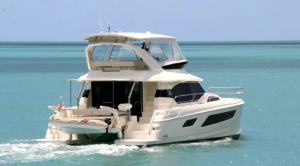 MarineMax Vacations uses the Aquila 44 in its charter fleet. Specs. : LOA: 43’8”; Beam: 21’6”; Draft: 2’8”; Disp. : 35,053 lbs. ; Fuel: 290 gals. ; Water: 206 gals. ; Power: 2×225-hp Volvo D4 diesels. The new 42-foot Aspen C120 power cat is anything but just another pretty boat. 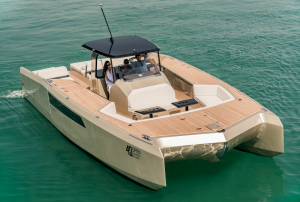 Developed by Larry Graf, one of the more creative people in boating, the new C120, like all Aspens, has an asymmetrical proa hull (think of native boats in the South Pacific), where the port side is 35 percent narrower than the starboard side, which houses the single 330-hp Volvo diesel. The point: Stability, performance and above all, fuel efficiency. Graf says the boat burns just 11 gph at 17 knots. 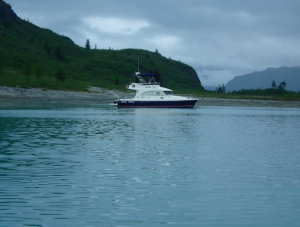 Graf founded Aspen Power Catamarans in Burlington, Washington, in 2008; he had founded Glacier Bay Power Catamarans earlier. At Aspen, he developed the patented proa hull, with the deckhouse offset slightly to port, and launched a 28, then a 32 and now the flagship 42. I tested the first 28 in Miami and have to admit that I was somewhat skeptical of the entire concept until I put the boat through her paces. I came away a believer. The C120 provides a smooth, stable ride, with all the advantages of extra living space found on a cat.The salon is 24 feet long and more than 10 feet wide, with excellent visibility from every seat. A 15-foot-long galley, filled with Corian countertops, occupies the port side. A six-person U-shaped dinette, with a high-gloss teak table that lowers, is to starboard; the primary helm is forward. Below, the full-beam master is forward with a king-sized bed on the centerline and a large owner’s en suite head. The guest cabin is on the starboard side with a queen-sized bed, with a full head and shower, while a third smaller cabin is on the port side aft, tucked under the galley, with twin beds. Up top, the flybridge has a wraparound seat on the starboard side, across from the helm, plus an aft-facing seat. The bridge extends aft to cover two-thirds of the cockpit. For extra strength, the bow sections are reinforced with Kevlar, and watertight bulkheads are glassed into place a few feet aft of the bow with Coosa, a fiberglass-reinfored polyurethane. In addition, each hull has three watertight bulkheads. A molded keel with a stainless steel shoe protects the single prop and rudder. Specs: LOA: 42’6”; Beam: 13’10”; Draft: 3’3”; Disp. : 22,500 lbs. ; Fuel: 180 gals. ; Water: 100 gals. ; Power: 1/Volvo 330-hp D6. The long, low, slender Axopar 37 Cabin, along with its smaller sibling, the Axopar 28 Cabin, caught my eye as I was walking down the dock at the recent Maine Boat Show in Rockland. The Axopars are definitely distinctive; they don’t look like any other boat out there. And they did attract a lot of attention, for two obvious reasons: They look like they’re fun, and they’re built for the way a lot of people are using their boats today. 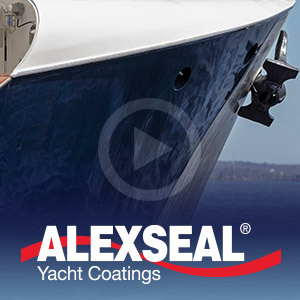 A Finnish yard, Axopar has been building boat since 2014. They have a reputation as well-made, immediately recognizable boats with cool looks and a reasonable price. And they’re said to be fun to drive. So far, Axopar has sold more than 1,000 of them, with 500 orders for 2018 alone. Much of the appeal of an Axopar, in addition to the looks, lies in its simplicity. It’s fun because it’s functional. You use the boat for a few hours or a day or weekend cruise, you wash it down and you put it away. This is no-fuss, no-muss boating that is gaining in popularity across the United States. The 37 comes in an open T-Top, Sun-Top or Cabin versions. The cabin boat drew attention in Maine because of the protection it offers from the weather, giving owners a chance to extend their boating seasons. The fully-enclosed cabin, with doors opening to the side decks, can seat four or more adults around a dining table, with an L-shaped settee across the back of the cabin. Two matching seats are at the helm; an optional fridge can be ordered under the co-pilot’s sat. A sunroof can be opened for more fresh air and light. The forward cabin has a large queen-sized bed and seating, plus an electric-flush toilet with privacy curtains. There’s also a sun-lounge on the foredeck. The company has various interior and cockpit configurations, including room for an aft cabin if you want to go cruising with guests or children. Azimut launched its new high-style, high-tech, 59-foot S6 sport cruiser at the Cannes Yachting Festival, where it won an award for innovation. The latest in the Italian builder’s S series, the three-stateroom, two-head boat features the glazed hull surfaces and distinct bow cap that make the series easily recognizable. 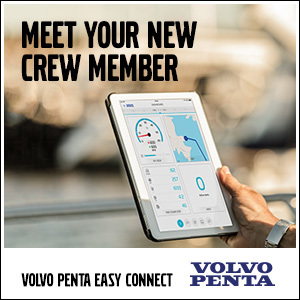 It also features carbon fiber construction and three Volvo 550-hp diesels with IPS700 pod drives for fuel efficiency, quiet cruising and fingertip-easy low-speed maneuvering around a dock. With an exterior by superyacht designer Stefano Righini, the Azimut S6 sports a low profile, highly raked windshield and equally low and raked radar arch. The interior is bright and clean with an elegant, contemporary European look, lots of open space and warm colors. 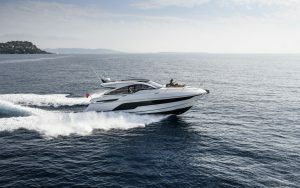 In the U.S., boat will be sold by MarineMax, the giant retailer, and it is likely to find fans in the larger cruiser market that used to be occupied by Sea Ray, which is now concentrating on boats under 45 feet. You walk on the new Azimut from a large, teak swim platform and up either side past a giant sunpad (another large sunpad is on the foredeck) to the heart of the cockpit with an L-shaped lounge and table. An overhang from the cabintop protects the cockpit from inclement weather. Glass doors lead to the straightforward salon, which is filled with natural light from windows all around and a large sunroof. A U-shaped settee with a table is to starboard, an entertainment center is across to port, and the galley is forward. The helm has a clean, high-tech look, and two matching helm seats. Down four steps, the accommodations deck has a full-beam master stateroom amidships, with a queen bed angled out from the starboard side, across from two lounge chairs to port, plus an en suite head and shower. The VIP stateroom with another queen bed is in the bow, also with an en suite head and shower. A third, smaller guest cabin, with two beds, is to starboard. 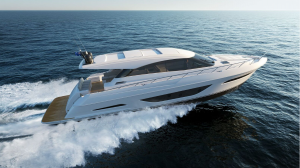 The hull of the Azimut S6 carries 15.5 degrees of deadrise at the transom. The company says the top speed is 35 knots, cruising speed is 30 knots. Specs. : LOA: 59’1”; Beam: 15’7”; Draft: 5’3”; Disp. : 58,800 lbs. ; Fuel: 687 gals. ; Water: 156 gals. ; Power: 3×550-hp Volvo IPS700s. The picture above shows the brand-new Back Cove 34O running with twin 350-hp Suzuki outboards. The first outboard Back Cove (and the first twin-engine Back Cove), this new made-in-Maine cruiser topped out at a rapid pace of 39 knots right out of the box. The 34O (the O stands for “outboard”) is a big change for Back Cove, which is part of Sabre, and an acknowledgement that the market, even for Downeast-styled cruising boats, is tilting toward outboard power. “It’s very exciting for us,” Bentley Collins, the Back Cove and Sabre VP for marketing and sales, told me. “We feel we have a unique proposition in that we have a great cruising interior and sheltered helm deck with the convenience and performance of the outboard drive line.” Younger buyers want the Back Cove styling but they also want more speed, he said. Kevin Burns, the builder’s VP of design and product development, drew a completely new hull for the 34O, but the deck and interior are the same as the Back Cove 32 that was introduced in August, 2016. He needed to change the hull shape of the 32 to maximize the outboard performance. Yamaha 300s will be the standard power, with Yamaha 350s or Suzuki 350s as options. Collins says the cruising speed should be in the 30-35 knot range, with a top speed of 35-40 knots. To reach those speeds, Collins said, they “put the boat on a diet.” The new topsides will be cored instead of solid fiberglass, for example. Another benefit of the new outboards, he said, will be increased storage capacity. The engine hatch for the original inboard 32 will still be on a hinge so owners of the 34O will have room for bikes or paddle boards or other water toys. I spent a beautiful day on the original Back Cove 32 just after it was launched in Rockland, in time for the Maine Boats, Homes and Harbors show there, cruising down to Portland. That boat had an optional 435-hp Volvo D6 diesel, and topped out at 28 knots. It had a range of about 260 nm at an easy 15.8-knot cruising speed. The boat was named Best New Powerboat Under 35′ at the Newport International Boat Show a month later. 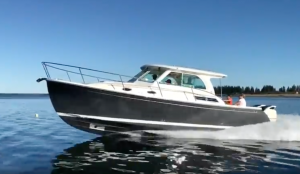 The 32 is a comfortable couple’s cruising boat, with classic Downeast lines and a long sheer. There’s a convertible U-shaped settee on the bridge deck to port (protected by the optional hardtop) and a cruising galley to starboard. Below, a generous island berth is forward; the head compartment is to port and a separate shower stall is to starboard. Interior highlights are in American cherry. Specs. for the new 34O: LOA: 38’11”; Beam: 11’10”; Draft: NA; Disp. : 17,000 lbs. ; Fuel: 250 gals. ; Water: 60 gals. ; Power: 2×300-hp Yamaha outboards. The Beneteau Swift Trawler 35, an update of the popular Swift Trawler 34, made its debut at the Newport International Boat Show. The new 35 has all the features of the 34, plus upgrades inside and out, the most obvious being new twin transom doors that open out to create a massive open space from the swim platform through the cockpit into the salon. 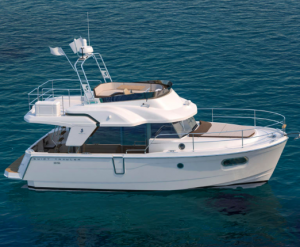 I have a very warm spot in my heart for the Beneteau Swift Trawler 34. Five years ago, I spent more than a week on one with George Sass Sr., the photographer, as we cruised 700 miles of the Great Loop from the top of Lake Michigan down to Chicago and then down the Illinois and Mississippi Rivers to Hoppie’s Marine Service, 20 miles below St. Louis. We found that living aboard was easy, with a large master and smaller guest cabin, a single head with shower, a bright open salon and a large cockpit where we relaxed each morning with coffee and each evening with something else. The 34 was particularly easy to drive; visibility from the helm was great, and the door next to the helm opened to the starboard side deck, making line handling easy. Best of all, the single 425-hp Cummins diesel produced an all-day-long comfortable cruising speed of 16 knots, consuming just under 16 gph. The 34 was a solid-running, fuel-efficient, long-range cruiser on a semi-planing flared hull, and its modern French looks drew second- and third-looks everywhere we went. The new Swift Trawler 35 has the same engine, so the performance should be the same, but it seems to have more windows to let in lots of natural light. The U-shaped galley on the port side opposite the helm has been redesigned a bit, there’s a new awning that extends from the flybridge out over the cockpit, and the flybridge itself comes with either a soft top or a Bimini, both with built-in LED lights. The trend toward outboard power keeps getting stronger and stronger. Now Cutwater Boats is introducing a new 30-footer with twin Yamaha 300-hp outboards because, says Cutwater President John Livingston, “We’ve had customers asking us to build a boat like this for a while now.” Livingston also says the new boat is “our biggest, fastest and most exciting Cutwater to date. The boat absolutely screams across the water.” Indeed, the new Cutwater 302 Coupe tops out at a blistering 50 mph. 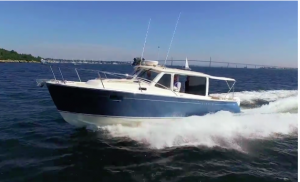 I haven’t tried the new 30 yet, but two summers ago I drove a Cutwater 28, with a single 260-hp Volvo diesel, from New York Harbor to Quebec City, and it cruised easily at about 16 or 17 knots. The new 30 with 600 horsepower would easily treble that, particularly since Cutwater redesigned the hull to accommodate the higher speed. The new boat has a fuel-efficient, double-stepped hull to get the boat on plane faster and what Cutwater calls a Laminar Flow Interrupter to make for positive turning at speed. The 302 Coupe sleeps six people in three separate areas. The forward cabin has an island double berth, a hanging locker, four portlights in the hull sides and an opening hatch overhead. The master head has a vanity, toilet and separate shower with a curved sliding door. Two more people can sleep on the convertible dinette, while two more can fit in a 6’8”-long cabin that’s tucked under the raised dinette. The cockpit is made for fishing with a 30-gallon live well and large fish boxes, but it doubles as an entertaining center, with seats that extend out from the hull sides and a drop-in BBQ grill, sink and shower. On the foredeck, two flush hatches open up to reveal cushioned seats with a forward lounge. As with all Cutwaters, the new 302 comes ready to cruise, with bow and stern thrusters, a nav package that includes a Garmin autopilot, Garmin 7612 GPS/chartplotter andGarmin radar, plus a 5-kW gas genset and Kyocera solar panel. The boat also is trailerable with a bridge clearance of 9’9” with the mast down; its height on a trailer is 13’2”. The Cutwater line now goes from 24 to 30 feet; all the boats are made in Washington state. Specs: LOA: 30’; Beam: 10’; Draft: 2’9″; Disp. : 9,800 lbs. ; Fuel: 300 gals. ; Water: 80 gal. ; Power: 2xYamaha 300hp counter-rotating outboards. Price: $314,937. Elling Yachts in the Netherlands just introduced its 65-foot Elling E6, a solid, safe, long-range cruiser to North America at the Fort Lauderdale show, and comes with some fairly unique features, including its ability to right itself in a capsize and its second get-home engine in the event of a catastrophic failure to the main. Ellings are built by Neptune Marine, which has 40 years of experience, and are designed and engineered to be the safest cruisers in the world. With a range of 3,500 nm, the new E6 could cross the Atlantic, explore the fjords of Norway, or complete the Great Loop with only one refueling. 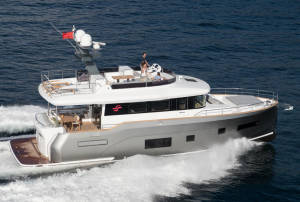 The E6 is powered by a single 900-hp Volvo D13 diesel, and tops out at 18 knots. It also has a spare 75-hp Volvo D2 with a shaft drive and folding prop; with this get-home engine, the boat goes 7 knots. The company uses Kevlar in the hull construction, and it conducts capsize tests to show the E6 can right itself in a 360-degree rollover. It is rated CE ocean Category A for offshore safety. Standard bow and stern thrusters make docking easy, even with just the single main engine. The flagship of the Elling fleet, the new E6 has four cabins. The owner’s stateroom is aft for privacy, with a walkaround queen-sized bed, lots of storage space, an en suite head and shower, and a high-gloss cherry finish. A VIP stateroom with a queen bed is in the bow with a head, and a third cabin is opposite the lower galley; it has access to the salon and can be used as a separate stateroom or as an office. A crew cabin with a head and shower is aft, with an entrance from the transom. A garage there is large enough for a 12-foot Williams tender. The aggressively styled, prize-winning, 31-knot Fairline Targa 43 Open will have its U.S. debut at the Miami boat show. Launched at the Cannes Yachting Festival in September, the British-built cruiser won the Best Exterior Design in the 14-18m category in the World Yacht Trophies competition there. The new Targa 43 is built for lounging and comfort on board. You can stretch out on the large sun pad in the cockpit, or on the almost-as-large sunpad on the foredeck. The cockpit also has U-shaped seating to port with a teak table for lunch or drinks under the hardtop; if you want more sun, the hardtop roof is retractable at the touch of a button. A garage, large enough to hold a Williams 280 MiniJet tender, is under the sunpad. The large teak swim platform lowers hydraulically to launch and retrieve the tender, and provide access to the water. The aft section of the salon opens to the cockpit, to create a large social area. It has a large U-shaped settee to port, with a table; a bit forward, opposite the two-seat helm, is another L-shaped settee. The accommodations deck is down four teak steps, and it comes with two options. In one, the master stateroom is midships, with the bed set athwartships facing a settee on the port side; it has an en suite head and shower. The forward stateroom has two single berths or a scissors berth, with an en suite head and shower on the starboard side. In the second plan, the master is forward and the guest cabin, with two single berths, is midships. Either way, the galley is down, between the two cabins, with a two-burner cooktop, microwave and fridge/freezer on the port side. An L-shaped dinette with a teak table is to starboard. Power for the Targa 43 comes from twin Volvo 435-hp IPS600 pod drives. Low speed maneuvering and docking is fingertip easy with a joystick control. With a deep-V hull, the boat cruises at 26 knots and tops out at 31 knots. Specs. : LOA: 46’6”; Beam: 14’2”; Draft: 3’10”; Disp. : 27,540 lbs. ; Fuel: 343 gals. ; Water: 115 gals..; Power: 2×435-hp Volvo Penta IPS600 pod drives. The Fleming 78 is built to European CE Category “A” standards, meaning it is a strong, well-engineered, go-anywhere, blue-water cruiser. Flemings are known for the exceptional engineering and attention to detail, inside and out. The redesigned 78 is an outgrowth of the Fleming 75 that was launched in 2000. Ten years later Fleming redesigned that boat’s hull to make it longer, with a longer keel and a bulbous bow, and named it the F78 Classic. The added waterline and new bow reduced fuel burn and increased range by 500. Powered by twin 1550-hp MANs, the 78 had a range of 2,000 nm at 10 knots. That boat had a split-level flybridge. On the new F78 Classic, the flybridge is on one level to make life easier and more comfortable. The boat deck is longer and the davit is positioned so you can launch a tender over either side or the stern. The cockpit also is larger and has more seating. The 78 has three staterooms with en suite heads and showers plus a separate crew quarters aft. The salon is made for cruising comfort, with an entertainment center with cabinets, bookshelves and a TV on the starboard side; an L-shaped settee with an oval teak table and storage are to port. A bar cabinet with a granite counter top, sink and fridge/icemaker is aft to port. The galley is forward with 18 linear feet if countertop, a double sink and everything you need for long-range cruising. A dinette is opposite with a curved banquette, oval dining table and storage. Below, the accommodations deck has teak and holly sole throughout; the bulkheads are faced with teak and there’s Ultra Suede on the paneling and headliners. Each stateroom is off a forward lobby, which is reached by stairs from the pilothouse. The owner’s stateroom has a king-sized bed with curved bureaus on either side, a desk with drawers and a walk-in closet. The port guest cabin can have either twin berths or a double berth; the VIP cabin forward has a tapered queen berth and hanging lockers port and starboard. The crew quarters and engine room are accessed from the port side deck aft, so crew can come and go without disturbing guests anywhere else on the boat. The pilothouse on the 78, as on all Flemings, is the cruising social center of the boat. It has an L-shaped settee set around a teak table; a pilot berth is optional. A chart table is to port and the helm has space for a full range of electronics in full-width upper and lower consoles. One centered Stidd helm chair is standard, but there’s space for two more. A day head with toilet and a ceramic basin set in a granite countertop is adjacent to the pilothouse. Specs. : LOA: 81’6”; Beam: 21’5”; Draft: 5’0”; Disp. : 165,048 lbs. ; Fuel: 3,000 gals. ; Water: 440 gals. ; Power: 2×1550-hp MAN diesels. The new Fountaine Pajot 37 MY, the company’s entry-level cruiser, is a combination of many things, all of them good. It has all the space inherent in a catamaran design, making for comfortable living and entertaining on board. It has the easy seakeeping ability also inherent in a cat, where the boat’s widely spaced hulls seem to glide over the water. And it has the modern, French esthetic that makes the boat stand out in a harbor anywhere in the world. Fountaine Pajot has a wealth of experience building cats, and the new 37 joins a 40 and a 44 in the company’s lineup. It also has a smart layout, making use of all the space for public and private areas on board. The salon is huge, taking advantage of the boat’s 16’7” beam, with wraparound windows and a large sliding glass door aft to let in an enormous amount of natural light. The galley is on the port side, with a U-shaped lounge and table to starboard. Below, the 37 comes in two configurations, with either three or four staterooms. In the three-stateroom version, the master takes up the port hull, with the head forward; it’s much larger than the master on most 37-foot monohulls, and has 6’6” standing headroom. Two double cabins are in the starboard hull, separated by the guest head for privacy. In the four-cabin configuration, perfect for a charter operation, there are two cabins in the port hull, sharing a head. Up top, the flybridge is protected by a hardtop and features what the company calls a “decadent” sunbathing area, and who’s to disagree. There are two helm seats, and an L-shaped lounge aft with a table. The cockpit also is made for sunbathing, or relaxing in general, with a settee aft facing a table. The full-beam, teak swim platform lowers for easy access to the water. The broad foredeck features two sun lounges, and a stowage area that’s big enough to hold a full-size bike. The boat’s draft of only 2’6” means it can navigate skinny water in the Chesapeake, say, or the Bahamas, while twin 220-hp Volvo diesels power it to a top speed of 22 knots. Dial back to 7 knots and you can have a safe range of more than 1,100 nm. And Volvo’s IPS joystick docking means you don’t have to worry about docking or low-speed maneuvering; you’ll look good anywhere by using its fingertip control. Specs. : LOA: 36’1”; Beam: 16’7”; Draft: 2’6”; Disp. : 17,800 lbs. ; Fuel: 370 gals. ; Water: 186 gals. ; Power: 2×150-hp Volvo diesels; 2×220-hp Volvo diesels. Grand Banks is moving up. After the successful launch of its new, highly acclaimed 60 last year, it has just launched the Grand Banks 60 Skylounge, designed for comfortable cruising in any conditions. The Skylounge is fully enclosed and climate-controlled, and offers more living space above the bridge deck with 360-degree unobstructed views while cruising or on the hook. Laid up with fully infused carbon fiber, the Skylounge keeps the 60’s graceful proportions and lines, while essentially adding another deck to the boat’s classic profile. 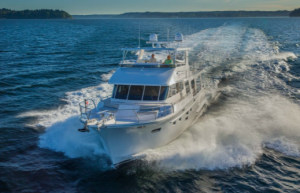 The original 60, which comes with a flybridge, is a fast, fuel-efficient, and strong long-range cruiser with Grand Banks’ iconic fit and finish. It also is an extraordinarily smooth performer; while cruising on it last fall in Long Island Sound I looked aft and the wake at 24 knots was almost flat. That boat had the optional twin 1,000-hp Cat diesels, and topped out at 31.1 knots. Dialed back to 7.3 knots, it burned just 2 gph, giving it an incredible range of 5,026 nm with a 10 percent fuel reserve. At a cruising speed of 18 knots, it burned 32 gph, with a range of 774 nm. The Skylounge version has a low center of gravity and long legs for cruising. Indeed, it has a range of more than 2,500 nm at 10 knots, and you can run from New York to Palm Beach at 21 knots without having to refuel. Standard power comes from twin 900-hp Volvo diesels with shaft drives. 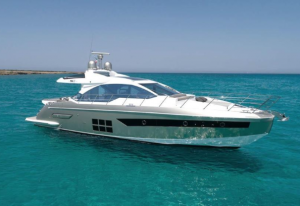 With optional power, the boat tops out at 36 knots and cruises at 27 knots. Built under the leadership of Grand Banks (and Palm Beach) CEO Mark Richards, the 60 is stronger and lighter and made with more sophisticated materials than previous Grand Banks, reflecting Richards’ decades of experience as one of the leading sailboat racers in the world. It has a warped hull shape with a fine entry and only 8 degrees of dead rise at the transom. The deck and flybridge are carbon infused, while all vinylester resigns and a cross-linked Corecell foam core make for a highly efficient power-to-weight ratio. Monocoque construction bonds all the bulkheads and interior furniture directly to the hull and deck for extra strength and quiet. Operating in two cruising modes, the Greenline 39 Hybrid can run under its 220-hp Volvo diesel at an 11-knot cruising speed, topping out at 18 knots, or under its electric power at 4 knots, topping out at 6.5 knots. Under diesel power, range is 1,000 nm at 7 knots; under electric power, however, range is only 20 knots. What this means is that under its green, electric, low-carbon footprint, the Greenline 39 Harbor can cruise around a harbor or two, or enter a quiet anchorage at night, silently and efficiently. 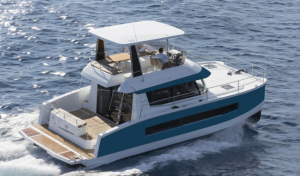 Either way, the Greenline 39 is a low-profile, light-filled, two-stateroom, one-head cruising boat with a fold-out transom that extends the swim platform to give more open space to the cockpit and make watersports super-accessible. A flip-up window opens the galley aft to the cockpit, making it easy to serve food and drinks inside and out. To maximize space inside the salon, the Greenline designers made the side decks asymmetrical; the port side is quite narrow, while the starboard side is wide enough to make going forward easy and comfortable. Four solar panels on top of the salon can power all systems on board for three hours in the electric mode. The Volvo diesel connects to a Mahle electric drive system. A clutch allows the boat to be powered by diesel alone, or electric alone. The diesel and an electric motor connect to a bank of rechargeable lithium battery packs. Built in Slovenia, the Greenline 39 Hybrid will be available in the U.S. early next year. A high-quality, unusually spacious, long-range cruising boat, the Hampton Endurance 658 is designed to be run by a couple, and it’s designed with redundant systems throughout to keep them safe at sea. And if they want to cruise with a large family, or entertain a crowd back in port, there’s plenty of room for that too. The Hampton Endurance 658 essentially is a three-stateroom, two-head cruiser, but it also has a crew cabin, which you reach via stairs from the aft port side of the salon, with another head, separate shower and small galley. It’s just aft of the large stand-up, user-friendly engine room, where there’s space all around the twin 1,000-hp Cat 12.9 diesels. The boat’s in-line backup systems include a spare genset, dual Racor fuel filters, water pumps and twin PTOs for hydraulics. The salon is bright with windows all around. Two lounge chairs and a TV are on the port side, across from a sofa that’s also a pull-out queen berth. The fit, finish and craftsmanship are excellent. The galley is two steps up and is filled with home-style GE appliances; it has a breakfast bar with three chairs. All the way forward on this boat, the Compass Rose, is a large U-shaped dining table that offers guests great views forward and on either side. Two ship’s doors lead to the side decks, while on the port side interior stairs lead up to the flybridge for safety underway. The aft deck has twin wing stations, port and starboard, for docking, with controls for the engines and bow and stern thrusters. There’s a day head here (the fourth on the boat), and a fridge is under a gleaming teak table. Forward, a Portuguese bridge offers another spot to relax or enjoy the passing scene. Up top, the fully enclosed and air-conditioned flybridge is massive, with three helm chairs, an L-shaped lounge and teak table. The boat deck holds an AB inflatable with a 40-hp Yamaha and a Steelhead crane. On the accommodation deck, the midships, full-beam master has a king-sized bed and lots of closets and moving-around space. The head is aft, and full-beam, with his-and-hers toilets, separated by a large, frosted-glass shower in the middle. A VIP stateroom with a queen-sized bed is in the bow, and a guest cabin, with either convertible twins or a queen bed, is to port. A large head with shower is across to starboard. 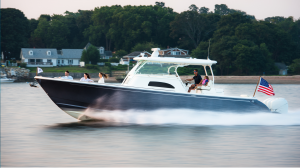 The 658 has a hybrid, semi-displacement hull, designed by Howard Apollonio, to make it efficient across the speed curve. The boat has a range of 1,300 nm at 8.5 knots, and tops out at about 20 knots. It burns only 24 gph at 14 knots. Specs. : LOA: 68’0”; Beam: 18’0”; Draft: 5’2”; Disp. : 102,500 lbs. ; Fuel: 1,750 lbs. ; Water: 400 gals. ; Power: 2×1,000-hp CAT 12.9 diesels. Here’s another first from Hinckley, the Maine builder who created an entire genre of boats with it launched its first single-diesel, jet-powered 36-foot Picnic Boat in 1994. Copied around the world, the Picnic Boat is regarded as one of the most successful boat lines of all time. Indeed, Hinckley has just launched a 40-foot version. But now, continuing its reputation for breaking the rules, Hinckley has introduced its first outboard-powered boat, the Sport Boat 40c, and in keeping with company tradition, it’s a beauty. For the new sport boat, Hinckley turned to Ray Hunt Design for the hull, which is a modern iteration of Hunt’s legendary deep-V that has been driving fast offshore boats for more than half a century. And, powered by standard three 300-hp Mercury outboards, the 40c is fast, topping out at 47 knots. Twin massive 627-hp outboards from Seven Marine are optional. The new Hinckley sport boat is built with epoxy-infused carbon throughout, for strength and light weight. The hull and grids are infused at the same time, then an inner layer of carbon fiber and an outer layer of Kevlar are added. The boat should be bulletproof. In keeping with the company’s upscale reputation, the boat is meant for luxury and comfort on the water. In integrated and retractable sun guard can cover the seating area. The leaning post has an optional ice maker and electric grill. A door in the hull side makes boarding easy, unless you want to use the integrated swim platform. A full-size companionway door leads to the protected living area. The galley is to port, with a fridge, cappuccino machine (standard), cooktop and microwave. To starboard is a full head with shower. A U-shaped settee is forward in the air-conditioned center cabin, with seating for three; it converts to a queen-sized berth. An optional Seakeeper 3 gyro stabilizer eliminates unwanted rock and roll. Specs. : LOA: 42’7”; Beam: 12’5”; Draft: 3’1”; Disp. : 19,000 lbs. ; Fuel: 450 gals. ; Water: 50 gals. ; Power: 3×300-hp Mercury Verado outboards. I thought I’d take a quick tour of the new Horizon 65 Power Catamaran during the Fort Lauderdale International Boat Show, where it was just launched. Then I realized there’s no such thing as a quick tour of this boat. It’s huge. It’s luxurious. It has beautiful woodwork – as in the curved railing on the stairs from the salon to the skylounge; it’s like a work of art. You don’t just glance at it and look away. You want to get up close and personal. I forgot about the quick tour and settled in to enjoy this new cat, hull number one of Horizon’s 65 PC series, a boat that combines the best aspects of a high-end motoryacht with the stability, efficiency, performance – and space – of a large cruising catamaran. Horizon builds its boats per the owners’ specifications. The 65 comes with either four en suite staterooms (two with king berth, two with queens), or three en suite staterooms with crew’s quarters. The twin hulls provide enough space so that these are all large, comfortable and filled with light from hullside windows. And this cat performs. Powered by standard twin 850-hp CAT diesels, it tops out at 26-plus knots, and has a cruising speed of 22 knots. Range at cruising speed is 500 nm. Stuart Hegerstrom, the co-founder of The PowerCat Company, which distributes Horizon power cats, said the hull design is the result of long-term research and tank testing. “We are in the enviable position of being at the leading edge of the power catamaran revolution,” he said. The symmetrical, semi-displacement hull was designed by Lavranos Marine Design of New Zealand, and it has a sophisticated planing wedge that provides a stable, soft and level ride, even in rough conditions. The first thing you notice when you climb on the new Horizon is the cockpit: It’s huge (the boat has a 24’ 6” beam) and it’s luxurious enough to be at home on a megayacht. There’s a curved settee across the transom, a high-gloss centered dining table, a wet bar and fridge, and enough space to hold a crowd. Indeed, at a media event there I counted 21 people in the cockpit, and there was room to spare. Horizon customizes the interiors to fit the owner’s wishes. The wife of this boat’s owner (it’s his third Horizon) is a chef, so the galley, with counterspace that stretched on forever, is dominant in the salon. Up top, the skylounge (the boat also comes in a plain flybridge configuration) also is huge. Twin Stidd helm chairs are forward, then there’s another wet bar with stools to port, plus a day head aft; a large L-shaped settee is aft to starboard. The boat deck all the way aft is large enough for a good-sized dinghy and any assortment of water toys. Horizon offers a management program for owners who want to put their boat in charter when they’re not using it. Part of the charter program is a try-before-you-buy offer, Ford said, where a potential customer can charter the boat for about 1 percent of its price before he makes a final decision. The base price of the new 65, Ford said, is about $3.9 million. The charter price for a week is $35,000. “We’ve sold so many yachts to people who charter before they buy,” he said. The Horizon power cat fleet ranges from 52 to 74 feet. Specs: LOA: 65’1”; Beam: 24’6”; Draft: 5’3”; Disp. : 111,250 lbs. ; Fuel: 1,500 gals. ; Water: 300 gals. ; Power: 2×850-hp CAT C12-9. 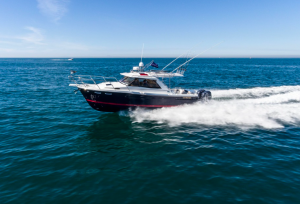 The beautiful Hunt 72 was named Best Powerboat at the Newport show two years ago, a particularly significant honor given competition from several other important and eye-catching new boats. But once you climb on board the Hunt, it’s easy to see why it was chosen. The classic lines are gorgeous; the proportions are just right, the sheer is long and graceful; standing on the aft deck and looking forward the teak side deck and railing seem to stretch on forever. Then there’s the 72’s exquisite fit and finish and virtually entire forests worth of varnished teak inside and out, not to mention the legendary Hunt deep-V hull that ensures safety and performance in all kinds of sea conditions. All in all, the boat took 80,000 man-hours to build. The latest in Hunt’s Ocean Series of luxury offshore yachts, the 72 has three staterooms with ensuite heads (plus a crew cabin), an elegant salon, granite countertops throughout, a large aft deck and an expansive flybridge that’s accessible from the aft deck or from an interior staircase from the salon. The midships, full-beam master has a king-sized bed, a walk-in closet, a settee, lounge chair and extra space all around. For privacy, the crew cabin is accessed by stairs from the aft deck; it’s just aft of the engine room. And the Hunt 72 performs. Powered by two CAT 1900-hp diesels tops out at 34 knots. Range at 20 knots is 400 nm, with a 10 percent fuel reserve. The boat has bow and stern thrusters, automatic trim and list controls, and the new CAT fingertip joystick for easy maneuvering around a dock. Specs. : LOA: 71’3”; Beam: 19’6”; Draft: 5’5”; Disp. : 125,000 lbs. ; Fuel: 2,050 gals. ; Water: 490 gals. ; Power: 2×1900-hp CAT C32 diesels. 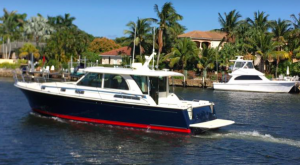 With its low profile, long straight sheer and more than a hint of clean, classic Down East lines, the new Hylas M44 was introduced to the United States at the Palm Beach show. 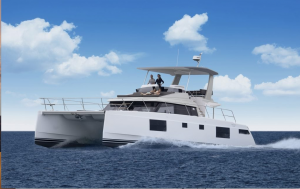 Hylas collaborated with the New Zealand builder Salthouse for the new high-end, two-stateroom cruiser, designed for maximum comfort, seakeeping ability and functional use of space. Inside, the new Hylas is filled with light, with large side and front windows, two long overhead sliding hatches in the salon, and a large glass door that separates the salon from the cockpit. The galley is aft, on the port side, and it has a hinged window that opens to the cockpit, making serving – and conversation – easy in the salon or in the cockpit. The U-shaped galley has Corian countertops, a large pull-out pantry for storage, a four-burner gas cooktop, oven and grill, microwave, fridge and freezer. A three-person bench seat is to starboard, while forward to port is a U-shaped dinette lounge and table, opposite the helm to starboard. The teak dinette table has an adjustable leg and a filler large enough to create a double berth. Three steps down, the accommodation deck has a large master forward, with a queen-sized island berth, hanging locker and four stainless steel portholes. Just aft on the port side the guest cabin has twin bunks, with a filler to create a double bed, plus an extra pilot berth above. The head on the starboard side has a separate shower with a molded seat and a retracting shower door. In the cockpit, there’s an L-shaped settee with a teak table to port and a bench seat to starboard, and a door opening to the teak swim platform. An overhang from the cabin rooftop provides protection from the weather. Hylas Yachts are made by Queen Long Marine in Taiwan, one of the most established builders there; some 500 Hylas yachts are now cruising somewhere in the world. 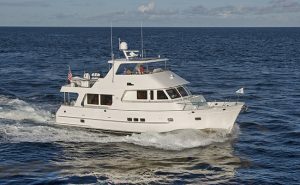 Hylas is a semi-custom builder, so they will try to accommodate a buyer’s individual cruising lifestyle. Kadey-Krogen does one thing – it builds blue-water, full-displacement, passagemaker trawlers – and it does that very well. Indeed, Kadey-Krogen just delivered its 600thyacht. The company is not known for change for the sake of change. But now Kadey-Krogen has come up with a major change – the new Kadey-Krogen 50 Open, where the main deck is continuous from the cockpit to the salon and the galley and then just one step up to the pilothouse. Indeed, Larry Polster, a Kadey-Krogen partner and vice president, says, “The Krogen 50 Open is revolutionary for our brand. She’s a model all her own.” Polster believed in the boat so much that he just took delivery of hull number one for himself and his wife. You enter the new 50 Open through one of five boarding doors, so you can easily board the boat even if the fixed piers are high or the floating docks are low. From the cockpit, you enter the salon through a weather-tight sliding door. An L-shaped settee is to port and more seating is to starboard. Large picture windows are all around. Forward, the galley is like a kitchen in an upscale home, with a Sub-Zero fridge/freezer, Viking range, optional dishwasher, lots of counter space and a large pantry. The pilothouse is just one step up, and a retractable partition wall between the galley and the pilothouse can be raised for privacy or running at night. Below, owners have a choice of accommodations, either a midships master and a VIP cabin forward, or a forward master and two other cabins. These arrangements can be highly customized. Either way, the master has a queen island bed with storage below, a private head with shower, and large closets (not hanging lockers). The guest stateroom has a similar head, and there’s a closet for a washer and dryer. The 50 Open, of course, has Kadey-Krogen’s Portguese bridge, with port and starboard wing stations. And you’ll feel safe going forward, with waist-high bow railings. Up top, the flybridge is large enough to serve as another entertaining area. It has a large boat deck and an optional summer kitchen. Also true to the Kadey-Krogen brand, the new 50 has a large, walk-around engine room with 6’ 6” headroom. Standard power is a single 231-hp John Deere; twins are an option. With standard power and a 10 percent reserve, range is 5,000 nm at 6 knots; 3,000 nm at 7 knots; 2,100nm at 8 knots; and 1,200 nm at 9 knots. Top speed is 9.4 knots; cruise is 8 knots. Specs. : LOA: 52’9”; Beam: 17’5”; Draft: 5’4”; Disp. : 68,000 lbs. ; Fuel: 1,240 gals. ; Water: 400 gals. ; Power: 1×231-hp John Deere diesel, or 2×125-hp diesels. Even with a flying bridge and raised pilothouse, the Krogen Express 52 manages to carry a classic low profile, enhanced by a long, flowing sheer line that emphasizes the boat’s distinctive profile. And the “Express” part of its name is not a misnomer: With twin 480-hp Yanmars the Krogen Express tops out at about 22 knots. Dial back to 8 knots and the boat has a range of 1,680 nm. With a semi-displacement hull, this express offers the best of a get-home-fast speed and a go-anywhere-without-refueling range. Inside, the Krogen Express exudes fine craftsmanship and cherry finishing everywhere. A raised bench seat aft of the helm in the pilothouse converts to a double berth; Dutch doors open to the wide side decks. Below, the master in the bow is bright, with six portholes and hatches, and massive, with 7’4” standing headroom; an en suite head has a separate shower stall with a seat. A guest stateroom can be configured as an owner desires, including an L-shaped settee that converts to a bed plus a desk. The engine room is one of the best in the business; you can stand up and walk around. Specs. : LOA: 57’6”; Beam: 15’11”; Draft: 4’0”; Disp. : 43,000 lbs. ; Fuel: 700 gals. ; Water: 370 gals. ; Power: 2×480-hp Yanmar diesels. Price: $1.6 million. Maritimo just launched a new 60-foot, three-cabin, two-head motoryacht at the Sanctuary Cove International Boat Show in Australia that has a unique space aft that can be arranged in many ways: As a traditional aft cabin, with an en suite head and shower and access from the salon or swim platform; as a “beach club,” essentially an upscale extension of the large swim platform for access to the water and water sports; as a garage for a pretty good-sized tender; or basically anything else a potential owner can think of. In other words, you decide. Maritimo is one of the most prominent builders in Australia, and Maritimos are built to perform. (I have driven some there and can attest to that; they’re solid and built for blue water.) The new X60 has an efficient hull with a deep-V bow and variable-deadrise aft. With optional Scania 925-hp diesels and shaft drives, it tops out at 34 knots. It cruises at 27 knots, where it burns only 52 gph. Standard power is twin 800-hp Volvos; twin 1,000-hp Volvos are also available. A Twin Disc joystick makes low-speed maneuvering easy and intuitive. The X60 also has Twin Disc Quickshift transmissions and electronic controls. The boat’s profile is low and flowing. The salon is filled with natural light coming in from large side and front windows, plus two skylights overhead. The galley is along the port side with a long countertop; a sofa and entertainment center are to starboard. Forward, the helm station, with seats for two, is on the starboard side; a large U-shaped settee is to port. Below, the accommodations deck features a full-beam master stateroom amidships, with a center walkaround bed and en suite head and shower. A VIP stateroom with a walkaround bed set at an angle is forward, with another head and shower, and a small guest cabin is on the starboard side. And then you can choose to have an aft cabin with a walkaround queen bed and en suite head and shower, or you may opt for the beach club, or for anything else that you want back there. The new Marlow 70E Mk 2 is the latest high-tech iteration of the 70E that Marlow started building almost 20 years ago, a fast and luxurious long-range cruiser with an Enclosed Command Bridge built for its new owner, a leader in the boating industry. Powered by twin 1,150 Cats, the 70E Mk 2 topped out at 27.55 knots in its very first sea trials in China, before it was put on a ship to be delivered to the U.S. in time for the Fort Lauderdale show. After sea trials in the U.S. and possible adjustments to the props, David Marlow wrote me that he expects the new 70E Mk 2 to top out at 28 knots. It already is a quiet boat, registering only 68 dB(A) at the upper helm at a 20-knot cruising speed. The Enclosed Command Bridge is the control center of the new Marlow, with a private captain’s cabin aft with a large head and stall shower. a large electronics array, a nav desk, plush seating and a refreshment center. On the boat deck, the Mk 2 has a 15-foot Novurania and a 1,600-pound davit. Below, the boat has a Seakeeper 26 gyro-stabilizer to ensure a comfortable ride in a seaway or at anchor. It sits in what Marlow calls “a Lexan-enclosed throne room” on the centerline and slightly aft of the longitudinal center of gravity. A large spare parts area is above the Seakeeper. Marlow yachts typically have large engine rooms, and Marlow wrote that the twin Cats “sit inside a virtually empty engine room of enormous size.” The engines can be encircled without impediment, he said, to inspect the sea chests. A separate machinery room contains a pair of 27 kW Onan gensets and various pumps and transformers. Aft, the lazarette is huge, with 6’ 8” of headroom; it houses the steering apparatus made with Marlow’s own custom metalworking. Marlow says the new owner is 6’ 3” and he can walk through the boat from the lazarette to the gyro room with his hat on. The boat carries 3,000 gallons of fuel, but the fuel management is fully automatic. The Marlow 70E Mk 2 is an upscale four-stateroom yacht, with a mate’s cabin forward of the lazarette on the port side with private on-deck entry, stall shower and head. The mate can keep watch over all the machinery functions through large tempered-glass observation windows. The exterior is built for relaxing and entertaining, with gathering spaces fore and aft with built-in tables and settees. The main salon is about 20 feet long with custom furnishings and a seamless Burmese teak high-gloss sole. A large country kitchen with a center island is built for family dining or entertaining; there’s also a U-shaped dining lounge that seats eight. The entire area offers 360-degree sightlines. Specs. : LOA: 77’9”; Beam: 18’6”; Draft: 4’10”; Disp. : 81,000 lbs. ; Fuel: 3,000 gals. ; Water: 500 gals. ; Power: 2×1,150-hp CAT C-18 diesels. The latest in the collaboration between Doug Zurn, the designer, and Bob Johnstone, the founder of MJM Yachts, the new MJM 35z is powered by two 300-hp Mercury Verado outboards, giving it both speed and power, while keeping the fuel-efficiency for which the brand is famous. It’s no surprise that the new boat has all the classic Down East lines of earlier MJMs, with its low profile, gentle tumblehome and long sheerline. Or that it’s a serious offshore boat, with a 20-degree deadrise at the transom and an ISO Certified B “Offshore” rating for stability and seaworthiness. The boat is a typical long, low, slender Zurn design, with a 3.5-1 waterline length to beam ratio. MJM’s wet, pre-preg, post-cure, epoxy composite construction makes for a stronger and lighter hull. And the MJM 35Z performs. On a recent test ride on Narragansett Bay with Johnstone and George Day, our publisher, we registered just over 39 knots as a top speed, and the boat gave a remarkably soft ride throughout the speed range. With its Seakeeper gyro stabilizer, it also was comfortable, even when we put it beam-to the waves. A former sailor himself (and the co-founder of J/Boats), Johnstone knows what sailors are looking for in a powerboat. The bridgedeck is protected by sliding glass or roll-up Strataglass sides; side boarding doors make stepping on board easy from a floating dock. The transom is open, and it’s all one level from the swim platform to the companionway. The two windshields open for ventilation. At night, the bridgedeck doubles as a cabin with settees converting to two full-length berths surrounded by a privacy curtain. Matching Stidd Admiral helm seats on swivel bases can be turned to face aft for socializing at the dock or at anchor. The 35z is meant to be used as a day boat or weekend cruiser. The interior is in the classic Herreshoff style with cherry-trimmed, off-white panels, and a teak and holly sole. The galley is to port, with Corian countertops. The Ultraleather V-berth lounge is forward, with an optional filler. And the head with shower is to starboard. Specs. : LOA: 35’8”; Beam: 11’0”; Draft: 2’8”; Disp. : 12,614 lbs. ; Fuel: 250 gals. ; Water: 58 gals. Power: 2×300-hp Mercury Verado outboards. 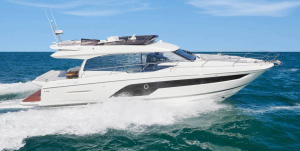 The newest power cat from the worldwide charter giant, The Moorings 433PC, with three staterooms and two heads, is designed as a mid-sized cruising boat for families or groups of up to eight guests. A well-mannered cat built by Robertson & Caine in South Africa (and also sold under the Leopard brand), The Moorings 433PC offers a comfortable, safe, relaxed cruising vacation with more than enough room, inside and out, for everyone onboard. The large, air-conditioned salon has windows for visibility all around, a galley forward, a convertible settee that can sleep two, and big glass doors that open to the cockpit, which has a large seating area and dining table. But what’s unusual is that another door opens from the salon to the foredeck, a signature feature of The Moorings’ new cats; if you open this door forward and the cockpit doors aft, you can have a continuous indoor-outdoor living space on board. A large owners’ suite occupies the entire starboard sponson, with the berth aft and the head with shower forward; the two guest staterooms are on the port side and share a head with shower. Up top, the flybridge affords great views all around; it has the helm station, another settee with a dining table, an electric grill and bar. 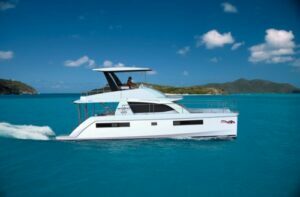 Initially, the new Moorings 433PC will operate out of the company’s large base in Tortola in the British Virgin Islands. If you buy the boat to charter, you have access to your own boat, or one like it, for up to 12 weeks a year at one of The Moorings 20 charter locations around the world. Specs. : LOA: 42’7”; Beam: 22’1”; Draft. : 3’1”; Disp. : 25,794 lbs. ; Fuel: 264 gals. ; Water: 206 gals. ; Power: 2/260-hp Yanmar diesels. 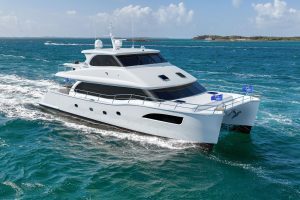 Horizon Yacht Charters is adding a new, luxurious Bavaria Nautitech Powercat 47 to its fleet in the British Virgin Islands. The new cat, with four staterooms, all with en suite heads and showers, will make its U.S. debut at the Miami International Boat Show from Feb. 14 through 18. 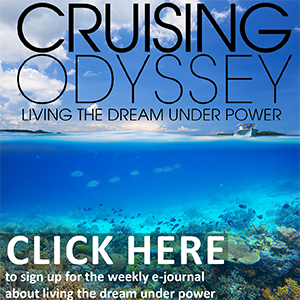 It will be available for charter at the big Horizon charter base on Nanny Cay in Tortola this spring. 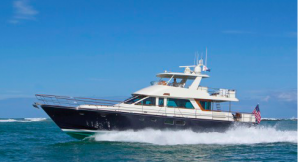 The fully equipped Nautitech 47 has large social and living areas everywhere. The cat’s massive beam, more than 24 feet, means you can enjoy condo-like comfort throughout the boat. The light, efficient hull, driven by twin 225-hp Volvo diesels, offers a smooth and quiet ride, with a range of almost 1,000 nm at 9 knots and a top speed of about 22 knots. 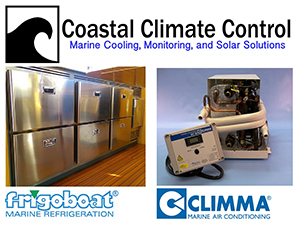 For comfort, the boat comes with air conditioning, a genset, freezer and watermaker; for navigation, it has a twin Simrad chartplotters, and even an aft-facing Simrad camera for docking. For fun, it has underwater lighting. 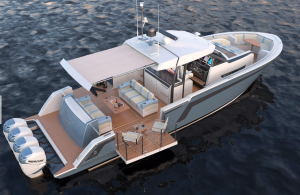 The flybridge has an ergonomic helm station, seating for ten, a hardtop (with built-in LED lighting) for shade, a dining table and wet bar and fridge. Forward steps lead to a lounge area in the bow with a table and settee. Other steps lead to the cockpit, where a lounge has seating for ten at a teak table. The cockpit is protected by an overhang from the flybridge. Large glass doors lead to the salon; the entire area can be opened up as one big social space. The salon has large windows all around. The U-shaped galley is forward to port; an L-shaped dining settee and a table on a pedestal are to starboard. Two large staterooms are in each hull, with side windows providing lots of natural light. The new cat is built at the Nautitech yard in historic Rochefort sur Mer; a French naval base was established there in 1666. Nautitech itself was founded in 1994; it says it is now the fourth largest catamaran builder in the world. LOA: 46’8”; Beam: 24’9”; Draft: 3’7”; Disp. : 28,660 lbs. ; Fuel: 290 gals. ; Water: 158 gals. ; Power: 2×225-hp Volvo Penta diesels. The first Motoryacht version of the Nordhavn 59 Coastal Pilot has a larger salon and galley than were on the original 59, plus a longer aft deck and boat deck that extend to the back of the boat. Jim Leishman, the vice president of PAE, Nordhavn’s parent company, said the engine room on the new motoryacht has “full standing headroom all the way to the stern and a fantastic workstation with overhead storage.” The Motoryacht also offers more space for outdoor socializing. This motoryacht version is hull number two in Nordhavns’ 59 Coastal Pilot series. Hull number one was introduced a year ago, and represented a major change for builder. 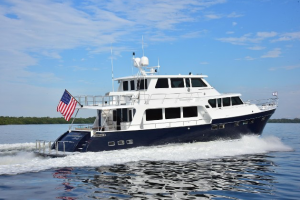 This three-stateroom, two-head Nordhavn, which tops out at twice the speed of previous Nordhavns, is the first to be built for coastal cruising, as opposed to the open-ocean, blue-water boats that have made the company famous. “This is a boat for people who don’t need ocean-crossing capabilities,” says J Leishman. Designed for owners moving down from larger blue-water boats, or others just getting into coastal cruising, the 59 Coastal Pilot is owered by twin 715-hp Cummins QSM 11 diesels. It has a fuel-efficient, semi-displacement hull that tops out in the 18-20 knot area; if you dial back to 8.5 knots, the range is about 1,000 nm. Although it’s a coastal cruiser, the new 59 is still built like a little battleship, per Nordhavn’s tradition. The boat has a CE – Category A unlimited offshore rating for its sea-keeping abilities and strength. In the new 59, the main deck consists of a salon, large galley and dinette with a lower helm (not a separate, raised pilothouse). The helm has a double-wide seat, with an L-shaped settee, seating four, to port. The dinette table is aft of the helm. The aft deck is protected by an overhang from the flybridge, and can be enclosed with canvas or Isinglass. The flybridge has seating for up to 12 people, with twin settees on each side of the helm. The boat deck aft has a Steelhead 800-pound davit and can hold a 14-foot tender. On the accommodation deck, the 59 Coastal Pilot is designed for either two or three staterooms, with two heads. This boat has the three-stateroom arrangement, with the owner’s stateroom full-beam amidships, with two comfortable chairs, an en suite head with dual sinks, a large shower and an equally large linen locker. A separate laundry is forward. A large VIP cabin is forward, and the third cabin, with three berths, is between the VIP and the master. The VIP and the third cabin share a head with shower. Ocean Alexander is stepping way outside its box and is building a totally new line, called Divergence, a 45-foot luxury outboard powered by four 350-hp Mercury Verados. The new boat, built at the old Sea Ray factory on Merritt Island, Florida, will make its debut at the Miami show. So far, Ocean Alexander has earned a reputation for quality and customer service in the large yacht and megayacht worlds. Its existing lineup stretches from 70 to 155 feet. But the 40-to-50-foot segment is hot now, as is the outboard market. The new Divergence fits into both of those trends, plus one more. The boat’s bulwarks in the cockpit fold down more than four feet on each side, providing enough room for two chairs and a table both port and starboard. More and more boats, large and small, are adding some type of hull expansion for entertaining; Ocean Alexander is tapping into a growing trend. Even with the bulwarks in their normal position, the cockpit is large enough to hold two large lounges and a table. The entire area can be covered by an awning that extends from the hardtop over the helm deck. The boat has an aggressive look overall, with a sharp entry and a raked windshield. The helm has three seats, and behind it a console can be set up as a bait station for fishing or an outdoor entertaining and dining center. Ocean Alexander says it will work with customers to design the boat to their desires. Forward, a lounge seat is built into the front of the console, and there’s U-shaped seating in the bow. Below, a U-shaped lounge can convert into a double berth. There’s a small galley, and an enclosed head with a stall shower. The hull has an 18-degree deadrise at the transom, so it should perform well offshore. And it has only 16’ 2” of air draft with the antenna down, so it can fit under most of Florida’s bridges as well as all of those on the Great Loop. An 11kW Kohler genset is standard. Specs. : LOA: 47’5”; Beam: 13’9”; Draft: 3’1” Disp. : 28,900 lbs. ; Fuel: 607 gals. ; Water: 100 gals. ; Power: 4×350-hp Mercury Verado outboards. Designed to be run by a cruising couple, the new Outer Reef 610 is spacious, fuel-efficient and easy to maneuver. 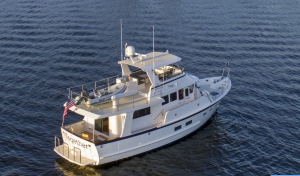 The heart of the Outer Reef 610 is the pilothouse, with its adjoining galley and weathertight doors leading to the port and starboard side decks. It has an L-shaped settee on a raised platform (a great place to enjoy the passing view), with a teak table on a stainless-steel pedestal. There’s a Stidd helm chair and a custom Outer Reef wood steering wheel. A curved teak stairway leads to the accommodation deck below. Forward is a Portuguese bridge with seating and a hinged door to the foredeck. The salon is large and comfortable with an L-shaped settee and a teak coffee table. Teak is everywhere, on the cabinetry, lockers and wall paneling. The galley has a teak and holly sole, as well as Corian countertops, freezer and fridge, an electric cooktop and oven, a microwave and a dishwasher. 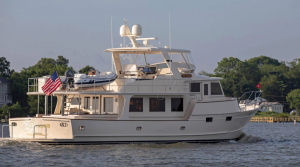 Below, the full-beam master is midships with a centerline king bed, an L-shaped, walk-in closet, teak end tables and a large en suite master head with Corian countertops, large shower, and a teak and holly sole. The VIP stateroom is forward with a queen bed and two hanging lockers. The guest cabin is to port with side-by-side twin berths and one hanging locker. The guest head is large with a glass shower door and access from the VIP stateroom or the lower hallway. The flybridge has a Stidd helm chair facing a stainless-steel destroyer wheel; two L-shaped settees provide lounging space. Stairs on the starboard side lead down to the pilothouse. A 1,000-pound davit is on the boat deck. The aft deck is protected by an overhang from the flybridge to make alfresco dining comfortable, and a large swim platform gives access to water sports. Specs. : LOA: 61’2”; Beam: 17’2”; Draft: 5’0”; Disp. : 93,000 lbs. ; Fuel: 1,000 gals. Water: 300 gals. ; Power: 2×500-hp John Deere diesels. Palm Beach developed the new GT series after it found a void in the high-performance market – a luxurious cruiser with a 40-knot top speed, and an economical cruising speed, that could be easily owned and maintained by an owner-operator. The new GT50 Open checks all those boxes. Powered by twin 600-hp Volvo IPS800 pod drives, the new GT50 has a top speed of 42 knots and an easy cruising speed of 35 knots. And it’s fuel-efficient enough to have a bluewater cruiser’s range; at 10 knots, range is 862 nm; at 25 knots, 413 nm, and at a flat-out 42.5 knots, 272 nm, according to figures from its initial sea trial. Richards, one of the best sailors in the world (he just won the grueling Sydney-Hobart race a record nine times), has instilled his high-performance ethos into the Palm Beach line, using high-tech materials with a low center-of-gravity design to create fast, strong and fuel-efficient yachts. The Palm Beach hull is laid up with fully infused vinylester cored e-glass construction, with a carbon fiber deck and superstructure. The bulkheads and deck are bonded to the hull structurally for strength and rigidity. The GT50 open is a two-stateroom, one-head design below, with the helm deck designed as the major social and entertainment center. A carbon-fiber windshield wraps around the front. A portable sun awning can provide shelter aft when it’s deployed. The forward-raked radar arch implies speed and movement. On deck, there’s an L-shaped settee to port with a dining table and a straight settee to starboard. The helm is forward to starboard, with helm and companion seats; another pair of forward-facing companion seats is on the port side. Aft, a fridge and ice maker are in the cockpit. Below, the master stateroom is forward with a large en suite head and shower; the guest stateroom aft has a queen-sized berth. The large galley is down. 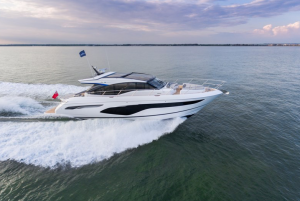 “The GT line is meant to offer a yacht that will help continue to set us apart in terms of performance, efficiency and easy ownership, all in one beautiful package,” Richards said. To develop the line further, the Palm Beach factory in Malaysia is working on a GT60 that will be introduced later this year, with a GT70 to follow. Specs: LOA: 54’0”; Beam: 14’8”; Draft: 3’1”; Disp. : 28,660 lbs. ; Fuel: 396 gals. ; Water: 132 gals. ; Power: 2×600-hp Volvo Penta IPS800 pod drives. Prestige, the high-end French builder, launched its new 590, the flagship of its Flybridge line, at the Cannes Yachting Festival. It had its U.S. debut at the Fort Lauderdale show. The low-profile Prestige 590 has fluid lines, a thoroughly modern, light-filled European interior, and a top speed of 29 knots. Started in 1989 as part of the powerhouse Beneteau Group, Prestige has been a worldwide success story. It has produced more than 4,000 boats, and says it is number two in registered powerboats from 50 to 60 feet in the U.S. The new 590 is at the top of the Flybridge line, which now has six models from 42 to 59 feet. The new 590 has three staterooms with three heads, plus an optional crew cabin aft, with its own head. This arrangement is popular in Europe. In the U.S., this space can be turned into a large garage for a tender. You can walk on the boat from the large, teak swim platform through a transom door on the port side. In the cockpit, a comfortable L-shaped lounge is across the transom. The cockpit is protected from the elements by an overhang from the flybridge, and it has a teak deck; teak side decks lead forward to the foredeck, also with teak, plus a super-sized sunlounge. A large glass door leads from the cockpit into the salon, with the galley aft on the port side. Forward, to port, is a luxurious settee with a high-low table. The helm, with a two-person seat, is to starboard. Large windows all around let in a lot of natural light, and add to great sightlines from the helm. On the 590, Prestige has gone high-tech with its new Ship Control software, which lets you monitor all the systems on the boat from a tablet or screens at the helm. Up top, the flybridge has a low venturi windshield (the boat’s air draft is only 19 feet). The helm is on the port side, and a settee is opposite. A large seating lounge with a table is aft. Below, the full-beam master stateroom is midships, with a centerline bed and en suite head and shower. The VIP stateroom is in the bow, with a double bed that can be separated into two singles; it too has an en suite head and shower. The third guest stateroom with two beds is to port; guests there use the day head with shower on the starboard side. Powered by twin 600-hp Cummins diesels, the Prestige 590 cruises at 23 knots, with a cruising range of 260 nm. Part of the international luxury giant LVMH (Luis Vuitton Moet Hennessy), the British builder Princess has launched the latest model in its V class of sport cruisers, a three-stateroom yacht that reaches 38 knots, powered by twin 1,200-hp MAN V8 diesels. The salon on the new Princess is built on an open plan, with lots of natural light all around; there’s even an electric sliding sunroof overhead. The galley is aft, on the port side, with a fully opening window leading to the cockpit. An L-shaped settee with a table is across to starboard. Forward, to port, opposite the helm, is a massive U-shaped sofa with a table. A crowd will be comfortable here. Sliding glass doors open aft to the cockpit, which is equipped with a wet bar, barbeque and fridge. The swim platform is large enough for everyone to enjoy water sports; an electro-hydraulic garage door is large enough for a ten-foot-plus tender. The foredeck has a large sunpad for an extra social area. Below, the full-beam master stateroom is amidships, with a double bed, dressing table, sofa and en suite head with shower. The VIP cabin is forward, also with a double bed and dressing table. The third cabin is on the starboard side with two single berths with drawers below and a hanging locker. The VIP cabin and the guest cabin share a head with shower to starboard; it also serves as the day head. A crew cabin with a single berth and head with shower is optional. Specs. : LOA: 62’11”; Beam: 16’0”; Draft: 5’0”; Disp. : 64,335 lbs. ; Fuel: 858 gals. ; Water 178 gals. ; Power: 2×1,200-hp MAN V8 diesels. The flagship of the Ranger Tugs fleet, starting at 21 feet, the new Ranger R-31 CB (for Command Bridge) is trailerable, meaning you could cruise one part of the Great Loop, say, this summer, bring the boat back home and start off where you left off next year. And you probably won’t have to worry too much about highway bridges. The flybridge folds down to reduce air draft on a trailer to 13’2”; you just unlock the canvas cowling, drop the inner supports and fold it flat. 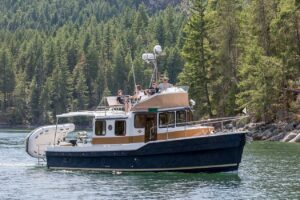 Ranger Tugs are run by the father-son team of David and John Livingston in Kent, Washington, and they have more experience building boats than just about anyone else on the planet. (Their company, Fluid Motion, LLC also builds Cutwater Boats). David Livingston designed boats for Wellcraft, Regal and Fountain, among others, and was the head of Bayliner when the company was making 56,000 boat a year. The Ranger 31 has two staterooms and a convertible dinette and lots of innovations. A reversible settee across the transom lets passengers sit facing forward or aft, while gull-wing seats fold out of the cockpit hull on both sides. The flybridge seats four and is reached by stairs, not a ladder. Garmin GPS units are standard for the bridge and lower helm stations, as are bow and stern thrusters. Specs. : LOA: 31’2”; Beam: 10’; Draft: 2’4”; Disp. : 11,500 lbs. Fuel: 180 gals. ; Water: 80 gals. ; Power: 1×300-hp Volvo D4 diesel. 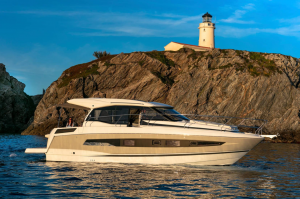 A popular success for the Maine builder, the Sabre 45 Salon Express was introduced at the Newport show last year and is returning in the middle of the company’s lineup. Last year the boat had just come from its first sea trials off Jupiter Inlet in Florida, where the waves were stacked, as is often the case there. But the new Sabre came through with flying colors, running 27.5 knots at a continuous cruise speed, burning just 35 gph. It topped out at 32 knots, burning 44 gph. Like many of its predecessors, this new Sabre is a quiet boat, registering just 72 dB(A) at cruise and 75 dB(A) at wide open throttle. 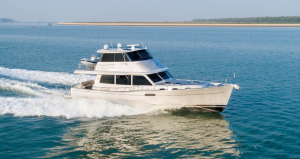 The 45, fitting between the company’s existing 42- and 48-foot models, is an all-new design with two staterooms, two full heads, and the built-in-Maine lines and craftsmanship that help define all Sabres. The master stateroom is forward, with an island bed and several lockers and drawers for storage (this is a cruising boat, after all); the master head has a separate stall shower and ceramic tile on the sole. The guest cabin is on the starboard side, under the helm. It has twin beds on tracks so you can slide them together to form a single island bed if you want. Aft the guest stateroom is a new storage room with space for a gyro-stabilizer, a washer/dryer, freezer or even a wine cellar. All the way aft, the cockpit is protected a bit by the overhang from the cockpit; an optional SureShade would provide full protection over the cockpit. A large bench seat is aft, against the transom, with a folding inlaid table for drinks or sandwiches. Power comes from two 435-hp Volvo diesels, paired to IPS drives for fingertip control over slow-speed maneuvering and docking. 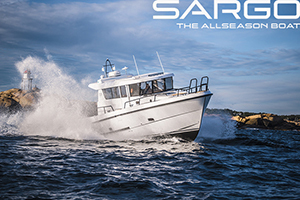 The Sabre fleet now runs from 38 feet to 66 feet. Specs: LOA: 49’0″; Beam: 14’8″; Draft: 3’9″; Disp. : 37,000 lbs. ; Fuel: 450 gals. ; Water: 150 gals. ; Power: 2/435-hp Volvo D6 engines with IPS pod drives. The new cruiser, built by Sirena Yachts in Turkey, has a Frers-designed hull that’s smooth and efficient at displacement and planing speeds. With two standard 650-hp Cat diesels, the Sirena 58 tops out at 26.5 knots; with optional 850-hp Cats, it reaches 30 knots. Dial back to 10 knots, and the Sirena 58 has a range of 850 nm, with a 10 percent reserve. The boat comes in a two- or three-cabin arrangement, with the interior designed by Tommaso Spadolini, head of the Spadolini Design Studio in Florence. In the two-cabin mode, one innovative feature is a stairway from the master stateroom that gives owners immediate, and private, access to the foredeck. “We built reinforcements into the structure behind the bed and covered them with oak paneling,” Spadolini said. “Basically, the owner can walk straight from this cabin take seven steps and emerge onto the foredeck without having to pass through the main salon, as is usually the case.” The foredeck, which also can be accessed via the side decks, has a large sunpad for lounging. The salon is filled with light from picture windows all around and is designed in a contemporary European style. The helm is to port and a door opens to the sidedeck to starboard. There’s an L-shaped sofa on each side, with a table to starboard. The flybridge is large and the boat deck aft extends over the cockpit for all-weather protection. The teak swim platform is super-sized to serve as a base for water sports. The new, award-winning 40 Open Sunreef Power Diamond Limited Edition just made its US. debut at the Lauderdale show. This super-modern, multihull cruiser just won the award for the Best Power-Driven Catamaran at the World Yachts Trophies ceremony in Cannes during the yacht show there; the award recognized this special Sunreef as one of the best and most innovative yachts in the world. Earlier the boat won the award as the Best Recreational Boat Up to 45 Feet at the Asian Boating Awards in Singapore. The Diamond Limited Edition comes with twin Mercury Racing 860-hp engines for 60-knot performance and features a Sun King Diamond Coating by Jean Boulle Luxury. It is the newest iteration of Sunreef’s foiling cat that the company launched four years ago. Since then Sunreef, which uses the historic Gdansk Shipyard in Poland, has worked to make its boats the most advanced, luxury performing cats on the market. The new 40 Open “has unbelievable amounts of lounging space, and is naturally balanced at high speeds,” says Sunreef President Francis Lapp. The boat’s 17-foot beam provides massive lounging space and stability at high speeds. Two lateral aft platforms fold out from the hull to enhance the boat’s living space, and the volume below the aft sunpad allows for storage of water toys and diving gear. A dining area on the bow has adjustable tables and lot of seating. This deck also can be turned into a comfortable cabin and head for overnight trips. Sunreef has included many upscale touches on the new 40, including fine upholstery, a wet bar and sun awnings. And you can order your new 40 Open Sunreef power in any hull color you want. Specs. : LOA: 40’0”; Beam: 17’0”; Draft: 2’3”; Disp. ; NA; Fuel: NA; Water: NA; Power: 2×860-hp Mercury Racing engines. Vicem Yachts, the Turkish builder that’s been specializing in using marine mahogany in the cold-molded construction process since 1991, just introduced its first fiberglass/epoxy model, the Vicem Classic 46IPS, at the Palm Beach International Boat Show. And, no surprise, it’s a beauty, both outside and in. The joinerwork is simply elegant. 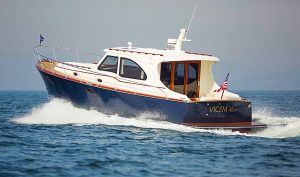 Designed by Vicem’s in-house team, the boat carries classic Downeast lines that just as easily could have been drawn in Southwest Harbor, Maine. The Classic 46IPS is powered by two 435-hp Volvo IPS 600s, offering joystick control and pod drives for easy maneuvering around the docks and greater fuel efficiency at higher speeds. The boat has a hard-chine hull and cruises at 26 knots and tops out at about 30 knots. 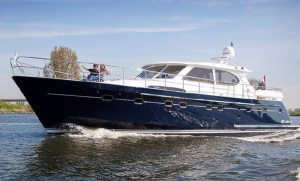 As with all Vicems, the new Classic 46IPS can be highly customized, with either two or three cabins below, accommodating either four or six people. The galley is down, with Corian countertops, two electric burners and a microwave. The owner’s cabin has a queen-sized bed and a head, also with Corian countertops, and a shower. The guest cabin comes with two single berths that can be joined to make a single queen; its head also serves as the day head. The cockpit has a teak sole and a custom table with a hydraulic lift. A sliding glass door separates the cockpit from the salon, which has large side and front windows that provide a lot of natural light. The salon also has a bar area and a comfortable L-shaped settee. A side door gives easy access to the starboard deck to make docking easy. For keeping the air conditioning running underway, the new Vicem comes with a 13.5kW Onan genset. On its first sea trial, the new Vicem was a very quiet boat, registering only 62 dB(A) at 25 knots. Specs. : LOA: 46’0″; Beam: 14’9″; Draft: 2’4″; Disp. : 39,683 lbs. ; Fuel: 500 gals. ; Water: 200 gals. ; Power: 2×435-hp Volvo IPS 600s. 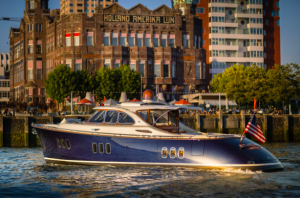 The Dutch-made Zeelander 55, an upgrade from the company’s popular 44, is a head-turning, luxurious express-type cruiser with hints of both a Down East lobster boat and a Gold Coast commuter boat while announcing a style all its own. From its fine bow to its torpedo stern, the Zeelander 55 is as contemporary as it can be. It’s all curves; there doesn’t seem to be a straight line anywhere. 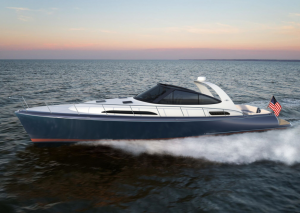 Powered by twin 1,000-hp Volvos and IPS1350 pod drives for an owner who wanted “the fastest Zealander ever built,” the new 55 tops out at 42 knots. One of the most striking aspects of the Zeelander 55 is the 360-degree view from the helm; actually, from anywhere in the salon. The wraparound windows have narrow frames and double-curved glass and they stretch aft to a fully opening glass wall that, when closed, separates the salon from the aft deck. In the salon, a raised L-shaped lounge behind the helm can seat eight, all under more light coming in from the sunroof. On the aft deck, one social area includes a wet bar with four stools, while all the way aft is another relaxing area for outdoor dining or sunbathing. There’s a side door for easy entry to the boat on each side of the cockpit, while the transom folds down to create a huge swim platform. The garage, which is large enough to hold a 100-hp Williams tender, is located amidships, between the master stateroom and the engine room, with an entrance in the side of the hull. Below, the master stateroom is midships, with a walkaround bed running athwartships. The master head with shower is on the port side. A large VIP stateroom is forward, also with a walkaround bed and lots of storage. A guest cabin with over-and-under berths is between the two. The guest and VIP cabin share a head with shower. Specs. : LOA: 55’7”; Beam: 16’4”; Draft: 4’11”; Disp. : 52,910 lbs. Fuel: 870 gals. ; Water: 200 gals. ; Power: 2×1,000-hp Volvo IPS1350 pod drives.